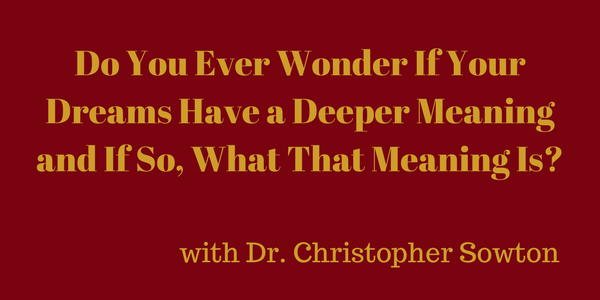 Do You Ever Wonder If Your Dreams Have a Deeper Meaning and If So, What That Meaning Is? How much do you know about the dreams your having at night? Did you know there are ways to return to those dreams when they end too quickly? Or that you can actually alter the events and outcomes of your dreams when they are scary or they are headed towards a not so ideal ending? Naturopath and Professional Dreamworker Dr. Christopher Sowton will be here today to explain these things and so much more. He also shares with you how to get a FREE preview of his newest book, Dreamworking: How to Listen to the Inner Guidance of Your Dreams. Don’t miss this exciting show!